As I was writing up my last post on my new build, Cassietetica, I was scouring the net for an illustration or two to break up the text (endlessly long blog posts can be quite boring to the eyes without pictures). During my search, I found a drawing by an artist with the signature of “Pozas”, presumbly made in 2004, that would be exactly how I would draw my tanker Monk, Lynncletica, if I had the skill. It’s a perfect drawing, right down to Lynn’s red hair with a braid, her chiseled physique–not to mention her attitude. I didn’t care for the review by the blogger that hosted this picture regarding how he thought Monks had little versatility–but he was discussing the class in the tabletop RPG pen-and-paper realm. The “real” Lynn, in an earlier life. He’s still probably wrong, though. Many people just don’t get the Monk class, no matter what media available to play the class–until they actually roll up a character, read up on how to play the character and take it seriously. Any nincompoop can roll up a Fighter and go “Hulk Smash!” on everything. It takes contemplation to build and excel a Monk properly. 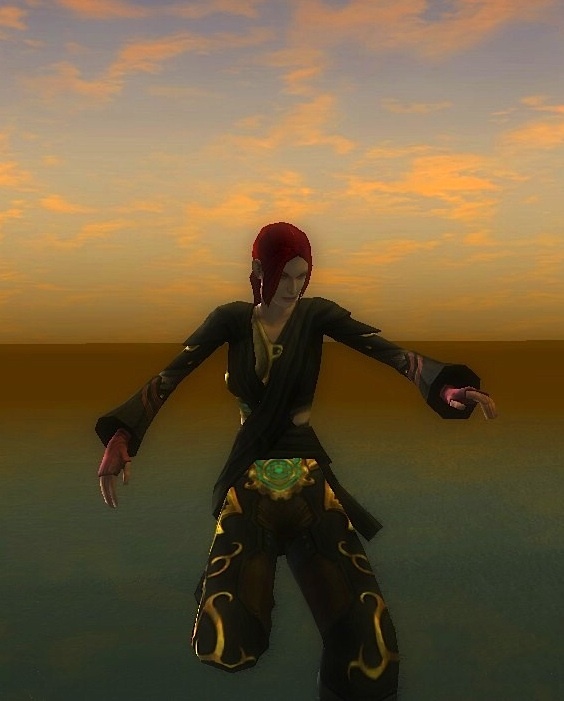 In DDO at least, a Monk can outlast practically any other class in fighting without outside assistance. Ki, and good technique, can do it all. Looks like I credit the illustration properly. Thanks to Claudio Pozas. Visit his site; he has great work there.